The U.S. Forest Service and 26 federal and NGO partners bring climate learning to you through a series of webcasts, webinars, and online climate education resources! 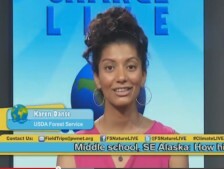 The ClimateChangeLIVE electronic field trips are a way to learn about climate change science directly from climate experts, educators, and students. This distance learning adventure provides an amazing collection of science-based, climate education resources and programs, aligned to national science education standards. There are 2 webcasts and 4 webinars. Project Learning Tree and the U.S. Forest Service introduce their GreenSchools! program and how you can foster student-led efforts to move your school toward sustainability. School classes that participate in Climate Change LIVE will be eligible to apply for GreenWorks! Grants! Join us and learn about these opportunities to help your school accomplish action projects that address climate change solutions. Project Learning Tree and U.S. Forest Service staff will present and overview the grant parameters and how you can apply. We also highlight success stories from schools in our GreenSchools! programs that have done exciting projects with these grants. In this webinar, ClimateChangeLIVE partners highlight professional development programs to empower you as a climate change educator. Each program offers training to increase your understanding of essential climate concepts and provide you with the tools and resources to implement a science-based climate change curriculum in your classroom and connect with networks of other educators teaching about climate change. Most of these programs offer grants to schools to help them implement climate change solution-related action projects, and include on-site and online training opportunities. This webinar highlights climate change education resources and programs from four of our partners. NOAA has a wealth of climate change education resources and programs to share with you. Learn about citizen science opportunities from Project BudBurst. The Department of Energy will share the Buildings Industry Technology Electricity Scenarios, BITES tool which students can use to make policy changes in the four sectors and run scenarios to see how their changes impact CO2 output as well as primary energy source dependence. DOE will also highlight a variety of reliable sources of information related to energy concepts and data. ClimateChangeLIVE offers educators a source of trusted, science-based materials, which are correlated to science education standards. 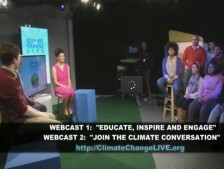 This webinar highlights climate change education resources from three of the ClimateChangeLIVE partners. Eco-Schools USA is a free K-12 program of the National Wildlife Federation and a part of the International Eco-Schools network of over 50 countries world-wide. Eco-Schools USA works to address sustainability on K-12 campuses around the nation and focuses on 10 pathways guided by a 7 Step Framework. The U.S. Forest Service highlights the Natural Inquirer science education journal's Climate Collection, which takes real-life Forest Service research and engages students in the science inquiry method, along with activities tied to the research. The U.S. Fish and Wildlife Service highlights their Student Climate & Conservation Congress (SC3), held yearly in Shepherdstown WV. SC3 brings together a diverse network of students and teachers from all over the country that are engaging in climate change education and solutions.